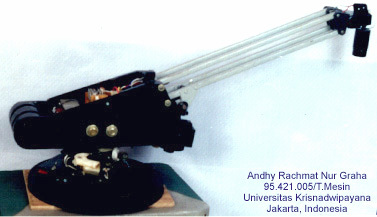 Krisna RPB-01 means "Krisnadwipayana Robot Pemindah Bahan 01"
To reach the material it is using magnetical iron coiled. and it will let the PC to control every movement of the robot. to build parts of the body. * Solenoide 500 coiled (home made). * Transformator 3A & 0,5A in one. * Reducer Gear boxes (home made). I planned, made and prepared this robot for 6 months.